The Very Finest Fish Oil Brussels International Taste & Quality Institute - Superior Taste Award 2010 Bottled in Norway for Maximum Freshness Omega-3's DHA & EPA Purity and Potency Guaranteed Dietary Supplement Rich source of DHA and EPA vitamin A & D free From Norway: The finest fish oil from deep, cold ocean-water fish. Bottled in Norway to ensure maximum freshness. Refreshing natural lemon taste. Take by the teaspoonful, mix with foods, and try it on salads! Suggested Use Take one teaspoonful one or two times daily At Mealtime. To retain freshness after initially opening the bottle, keep refrigerated and preferably use within 3 months. 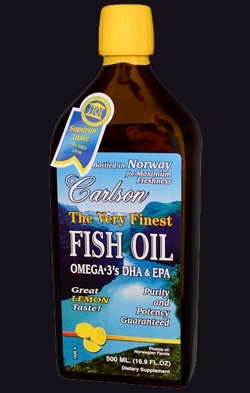 Other Ingredients Omega-3 fish oil, natural lemon flavor, natural tocopherols. Purity Guaranteed This product is regularly tested (using AOAC international protocols) for freshness, potency and purity by an independent, FDA registered laboratory and has been determined to be fresh, fully-potent and free of detrimental levels of mercury, cadmium, lead, PCB's and 28 other contaminants.